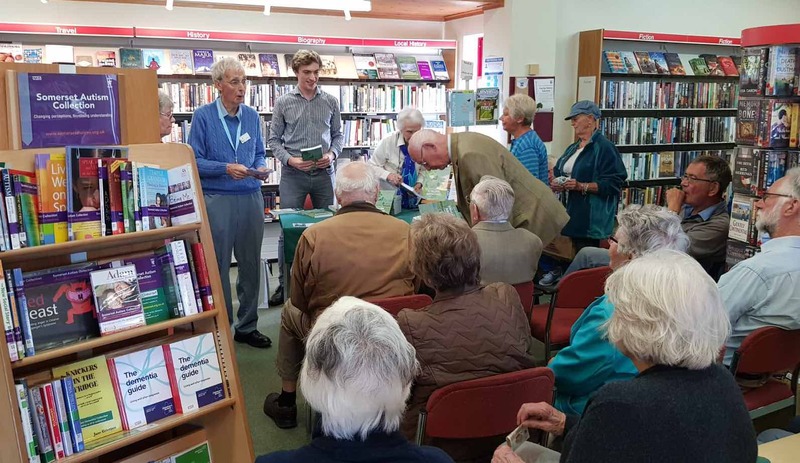 It was with great pleasure today that I was able to launch the book “A Village Inheritance” with my grandmonther, Clare Court, at Williton Library in Somerset. The event was a culmination of several years of hard work to get the book ready for publishing, and almost 50 years since the book was originally written, the book is available for all to enjoy! We had no idea how many people would be interested in such an event. As I travelled to Somerset this morning, I wouldn’t have expected that almost 30 people would find the time in their days to attend our talk. But we were amazed to see so many people join us, and it was fantastic to be able to share our story of the book with them and share the work of my grandparents with so many people. This blog provides a short write-up on the launch, the book, the process of creating it and finally the longer term project to help publish as much of my grandfather’s work as possible. I discovered a beaten copy of the book after my grandparents mentioned it in passing back in 2015. At the time I don’t really know what my overall aim was, but I had the thought that I should convert the original copy to an electronic version. I don’t think I intended to get it published at the time, but just thought it would be a great way to share the text within the family. Figure 1: The finished book by the original manuscript. It was a fairly painstaking process converting the book. 40 year old typewritten text is not easily recognised by image recognition software, and although I was able to scan all the book, about 5% of letters were misread. A “d” could easily be recognised as “ci”, specs of dirt on the paper would create all sorts of mayhem. It took several rounds of proofreading for all the little errors to be weeded out (although I imagine there will still be errors somewhere in the book!). A lot of work went into finding all the images for the book. The ones in the original book were all low-quality copies, and therefore I spent hours going through all of my grandpas old photos. A notable example were the house drawings, which were produced in 1921 and clearly reaching suffering after 100 years of being in storage. I got these digitally restored to be able to include in the book, and I think they are one of my favourite parts of the book. Figure 2: The original house drawings produced in the 1920s (left) and the digitally restored copy (right). With the written content and images sourced and updated, it was ready to try and get the book published. Fortunately, I have always liked formatting my work (I would spend way too long making any university assignments look pretty before submission). So I set about trying to make the book look professional, and ended up editing a LaTeX book template. With the book finally finished, I self-published the book through Kindle Direct Publishing which made it surprising easy to sell books without having to invest lots of money upfront. My grandparents have always had a natural flair for storytelling. My grandpa had an amazing ability to bring history to life, and was able to capture the spirit and feel of victorian Somerset. He had such a love for Somerset, a passion which reflected through his writing in this book. 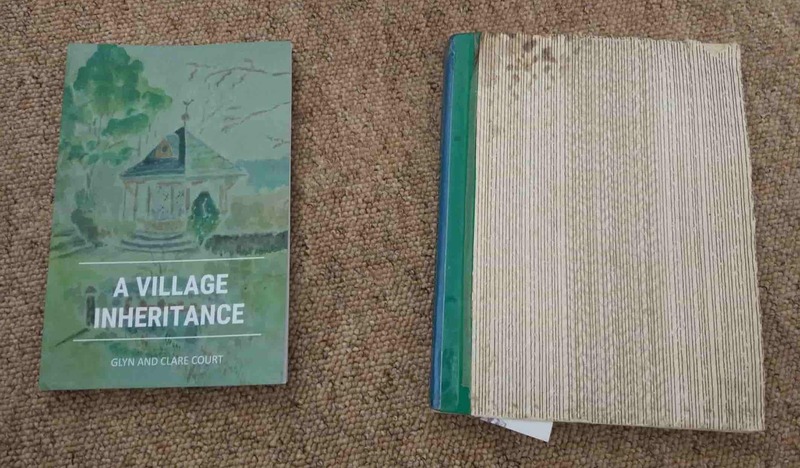 A Village Inheritance shares a combination of family history, local history and autobiography. It was written when my grandparents Clare and Glyn Court had just inherited Glyn’s childhood home and family business in 1967. Already leading busy lives as teachers, they weren’t prepared for the added responsibility and pressures which came from leading a village shop whilst bringing up a young family. The story of running the business, highlighting their excitement, optimism and the difficulties they faced. The book is available to purchase through Amazon. All books are dispatched directly by Amazon and will be with you in 3-4 working days. My grandpa spent his entire life writing, having produced many books, articles and weekly columns in the local paper. He was still busy writing up to the time he passed away, and was busy working on two books which were nearing completion. He also has an extensive archive of unpublished work from a lifetime. In the last few years, we grew very close through his literature. He was so thrilled that a grandson of his was interested in his work, and I was equally as excited that my grandfather had written a such much down for us all to enjoy. However, much of this work is not available for all to enjoy, so I have set about a mission to publish as much of his work as possible. A Village Inheritance marks the first step in this process, but there are many more books and collections which are planned for the future. I have set up the website www.glyncourt.co.uk, and over the coming years I will start to build the collection of his works. It is a mammoth of a task, and given the amount he has written, it could potentially take me a lifetime to complete. I have a vision where his work is available for all to enjoy, so make sure to check back in the future once I have had time to update the website! Sharing the work of my grandparents has been a real joy, and is something I hope will bring pleasure to others beyond the family. The reception for the book was outstanding and it was incredible to see such a positive reception for the book. I am looking forward to sharing more of their work in the future.